Darren joined the firm in 1993 and has in excess of twenty years’ experience in legal practice. 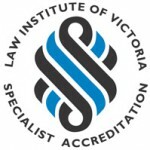 Darren become a Law Institute of Victoria Accredited Specialist in the area of Wills & Estates in 2008 and is currently one of only a small number of Wills & Estates Specialists in the State. Darren is also a member of the Society of Trusts and Estates Practitioners. Jessica is the firm’s Conveyancing Clerk. Jessica has experience in all aspects of conveyancing and provides dependable and efficient services in all sales and purchases of properties (both residential and commercial) including sub-divisions and off-the-plan.